Web site building tips are actually quite similar to running tips. One little step at a time and before you know it your at the top. Hi, I'm Lorelie and my husband is Scott "Coach Carvey." We were inspired to build Carvey Running Tips for a few reasons. Scott has many gifts. But his gift of wit and humor, just flows from pen to paper or more often from keyboard to computer screen. He spent a lot of time writing very funny posts on the Track and Field Forum. I am talking thousands of posts and hours spent. I thought there must be a way to capitalize on his comedic writings. There is a reason for his talent. Genetics! His brother is the famous Saturday Night Live comedian, Dana Carvey! I'm not trying to name drop. I only mention this because it's an interesting little tidbit that you the reader may find interesting. People have always told Scott, including Dana, that he was as funny if not funnier than his famous brother, whom by the way is his best friend. So as I was trying to figure out what to make this web site about (it took three months of agonizing) I had a lightbulb moment. I realized that we could build a website around Scott's unique voice and use his one of a kind artwork. In the back of my mind I was also thinking that this could possibly launch a new career path. Running is by far the most passionate subject for Scott to write about and I am a fitness instructor. It was perfect! I could help with the factual side of things. Because I am NOT funny! 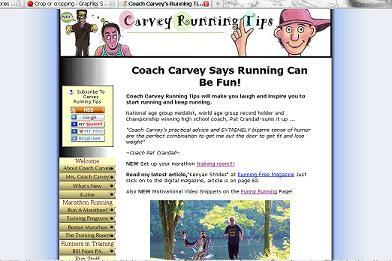 So we teamed up to build Carvey Running Tips. I am basically the web master and Scott does all of the artwork and humorous writing. Site Sell and all of the success stories from SBI customers sold me on their program. I figured with a 30 day money back guarantee. I couldn't go wrong. I was right. The success of our web site is Site Sell and perseverance. I know this sounds cliche' and possibly sales-y but I have built websites using other companies and those sites barely get traffic in comparison. I didn't understand the correct way to build a page. SBI's success depends on our success, so they go all out to help you through the process. So far our biggest accomplishment is Scott being discovered. He was asked to write for a running magazine called Running Free, and most recently a book deal is in the works. It is our websites keywords and structure that allowed this to happen. It took exactly one year before things started coming together. We started building in July 08. Scott's first article came out in July 09, and by July of 2010 we should have a book on the bookstore shelves. He is officially an author. WOW!!! We do make a small income with adsense, but not enough yet to make a living with, although we see an increase each month and plan on building on that. Take your time deciding what your website subject will be and take baby steps if need be to build it correctly. Choose a subject you really enjoy and are passionate about, you will need to write many pages and become involved with online communities, so you really have to be passionate about it. Investigate Site Sell. We could not have done this without following the Action Guide steps and getting help from others on the forums.